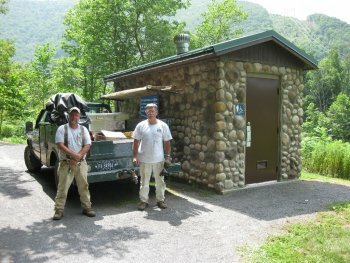 DCNR workers Chuck Diggan and Kevin Finnefrock spent August 11th cleaning the venting systems at comfort stations along the Pine Creek Rail Trail. Near the end of their day's hard work, they stand outside the station at the south end of the village of Cammal. Diggan and Finnefrock cleaned dirt and insects (including bees' nests!) from the vents, their blades and their solar cells, resulting in the systems' return to good working order. With the sun shining on the systems after these men's labors, the blades will turn freely again, resulting in restrooms that smell fresh and clean. Visiting bicyclists, walkers and joggers during the rest of this summer will benefit from the efforts of Diggan and Finnefrock.